Here's how that's even possible. After a terrible coughing fit, you’ve probably brushed it off by saying, “I thought I was going to cough up a lung." You were exaggerating, of course. But it turns out you really can cough up a lung, or at least a clot that's formed into a mold of one. A 36-year-old California man recently coughed up a blood clot in the shape of his bronchial tree after being hospitalized for heart palpitations. According to a case report published in the New England Journal of Medicine, the man was admitted to the ICU at the University of California, San Francisco Medical Center with chronic heart failure. He had a history of poor cardiovascular health and previously had a pacemaker implanted, in case his heart became completely blocked. Throughout his first week in the ICU, he regularly coughed up blood and mucus, but one coughing spell was worse than the others. 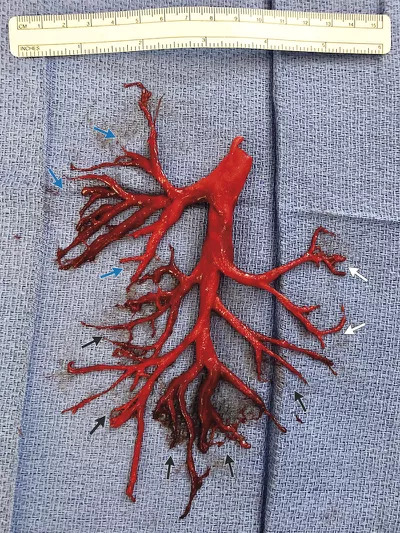 He coughed up a tree-shaped blood clot that had formed a cast of his right bronchial tree (pictured above), which has tubes that distribute air to the lungs. Yep, he literally coughed up a gel-like mold of part of his lung. After the incident, a tube was placed in the patient’s throat to allow him to breathe. But he passed away the following week from heart failure complications, including too much fluid in the blood and not enough blood pumping through the body. The patient was already in poor health when he entered the hospital. He had an ejection fraction (EF)—which measures how much blood the left ventricle pumps out with each contraction—of only 20%. A normal EF is above 55%, according to Mayo Clinic. He also had bicuspid aortic stenosis, a birth defect that can cause one of the valves that pumps blood through the body to become narrow, reducing blood flow from the heart to the body. The patient previously had his aortic valve replaced because of the defect. The violent coughing spells the man had during his first week in the hospital likely strained his already weak heart and lungs, leading to him coughing up the mold of the bronchial tree, according to the case report. So yes, in a sense, it is possible to cough up part of a lung, but it isn’t possible to cough up an entire lung. A whole human lung is simply too large to fit in your throat. You can, however, have such a violent coughing spell that your lung pops through your ribs, and you cough up parts of it. Thankfully, this is very rare and would likely only happen to people with preexisting heart conditions.